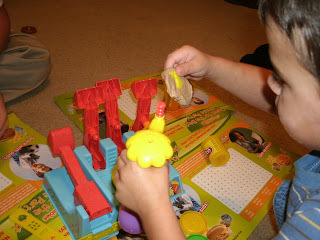 I wanted to let my readers know about an awesome contest called Ready Set Play-Doh ! Kids 10 years of age and younger can enter the Hasbro Ready Go Play-Doh Photo Contest for a chance to win a $5,000 Playroom Makeover and a $5,000 donation to be awarded to the school of their choice! To enter the Play-Doh photo contest, have your child create a make believe version of their favorite food out of Play-Doh then upload the photo along with the contest entry form for a chance to win. Daily prizes will also be given away in a separate sweepstakes. You will have 4 ways to enter the sweepstakes where you will have a chance at winning various Play- Doh prize packs! The deadline to enter is September 30,2009. Visit HERE to enter ! 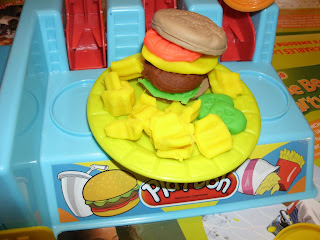 Also, Play-Doh has a new set which will be debuting in September- the Burger Builder. I was thrilled to be offered the chance for my boys to review this new set ! 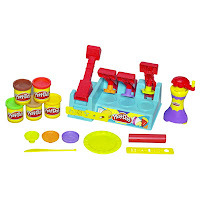 Cook up something extra special with this fun PLAY-DOH set and its tons of burger-building acc essories! Mold pretend "burger patties", "onions", "lettuce", "pickles" and more, press out "fries" and then use your special TWIST-A-CHIP tool to crank out the coolest pretend potato chips you could possibly serve up! · Super-fun PLAY-DOH set lets kids press, mold, twist and "cook up" a "burger" and "chips" meal that looks almost good enough to "eat"! · Includes 5 56.6g cans of PLAY-DOH compound, molds, press, plate, plastic knife, rolling pin, and TWIST-A-CHIP tool. · Ages 3 and up. Notice Parents: Contains Wheat. Non Toxic. As soon as the Burger Builder set arrived the boys wanted to play with it. The first night, we sat down as a family and everyone started to make their own custom burgers. It was fun watching my boys being so creative ( even my 14 yr old that would not admit he was having fun or wanted to do it). While my older boys where busy making their own creations I was helping my toddler make his. I think my little ones favorite part was making the chips. 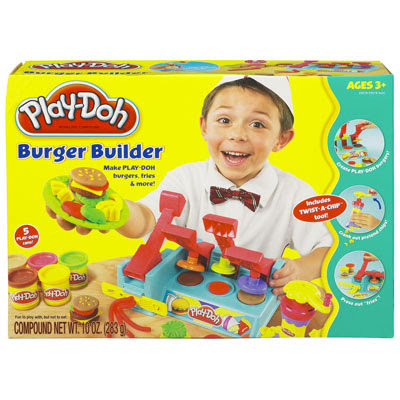 BUY: To find out where to purchase the Play-Doh Burger Builder (ARV 15.99) visit HERE ! Playdoh is the one thing I haven't bought for Pea yet. I bet she'd love it though!! Especially if she was able to make a hamburger!